Lenox 100 has been around since the early 1970s – it was the first domestic 100-percent cotton paper created specifically for fine art applications. Legion Paper cofounder Len Levine designed it for artists who wanted to work in sizes beyond the standard. It’s available in 38-by-50-inch sheets, and 60- and 72-inch wide rolls – a first for 100-percent cotton paper. It has unique characteristics – no deckle edge or watermark, and a distinct off-white shade, for instance – that make it suitable for mixed media. It’s dimensionally stable, so its excellent for silkscreen, and its medium-textured surface is ideal for graphite, pastel and charcoal drawing techniques. For Pehrson, size matters. “The large rolls enhance my art by allowing me to work in the scale that I need for big spaces,” he says. The medium-textured surface also works well for him – it’s important to him that his artwork absorbs light. 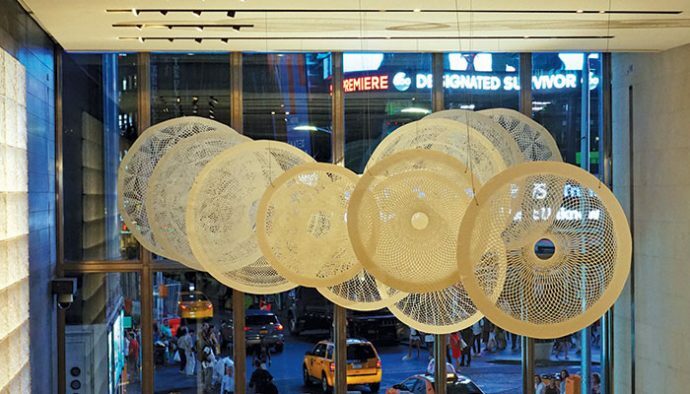 In September, at the iconic Viacom location in New York’s Times Square, Pehrson unveiled “The Journey of Light.” It features three immense light-based installations made entirely of Lenox 100. When he was finished hand-cutting geometric patterns on more than 600 square feet of the paper, Pehrson had gone through 11,083 X-ACTO blades. He designed “The Journey of Light” to play on the natural light from the sun’s transit across the building’s entrance windows. “The monochromatic paper structures generate a constant flux of shadows and shifting light as day transitions to night,” says a statement by K. Imperial Fine Art, the gallery that represents Pehrson’s work. “Journey of Light” is on display through November 30. Drive by Press is a mobile printmaking studio created “to promote the growth and democratization of art through printmaking.” Its team prints graphic tees and fine art prints using hand-carved woodcut designs. Their artisan process creates a unique garment – and a unique experience – for their audiences. Drive by Press perfected its formula for printing onto various cotton-based textiles by collaborating with Gamblin Artist’s Colors to create Drive by Black Textile Relief Ink. 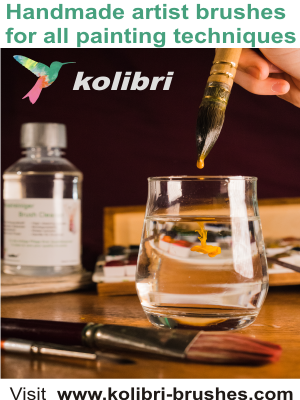 It’s the first and only ink formulated specifically for printing woodblocks onto textiles. It’s handmade in Gamblin’s Portland, Oregon, factory and formulated for even coverage (for rich darks), quick drying time and color fastness. The end result is artist-grade permanence and color. Drive by Black Textile Ink is part of Gamblin’s assortment of Relief Inks formulated for a range of techniques including woodblock, linocut, monotype and Solarplate. They’re bound in high-quality Burnt Plate Oil and contain the right amount of stiffness and tack to hold fine detail, while spreading evenly on blocks or plates. The Drive by Press crew is made up of artists and printmakers who travel across the country from studios in Brooklyn and Los Angeles with a 14th-century-style press bed loaded into a 21st-century vehicle. People participate in the printing process through “press-on-wheels” parties and promotional events at rock concerts, outdoor festivals, universities and exhibitions like Art Basel and the Chicago Art Fair. “Artists can now take their unique designs out of the sketchbook and into their wardrobe,” says Cecilia Mignon Hamlin, printmaking specialist at Gamblin. “Through the marriage of fine art printmaking and DIY t-shirt printing, artists are realizing how accessible it is to personalize apparel in their own homes or studios.